Posted by Dave Emory ⋅ March 13, 2014Post a comment Email This Post Print This Post Tweet This! We suspect that the former Ms. Chumachenko was the real power behind the throne. While president of the Ukraine, Yuschenko presided over a fundamental makeover of Ukrainian history and, through that, political ideology. The dramatic and fundamental nature of this revisionism paved the way for the public positioning of the fascist Swoboda party as a viable, democratic entity. Swoboda is a primary element in the new Ukrainian government, dominating the military and judicial processes of that country. PLEASE take time to examine the text excerpt below in detail. Note the bold-faced parts. Orwell made manifest. Yuschenko literally undertook to create a ministry of truth, in effect, designating the former KGB archives as the focal point to begin a fundamental political makeover of Ukrainian history and ideology. Contrasting the OUN/B and its affiliated organizations as truthful and just, contrasted with “everything Soviet” as false and evil, Yuschenko succesfuly effected a wholesale revisionism of Ukrainian politics and history. Yushchenko appointed the young activist Volodymyr V’’iatrovych (b. 1977) direc­tor of the SBU archives [the focal point of the successful revisionist effort–D.E.]. V’’iatrovych com­bined his posi­tion as government-appointed mem­ory man­ager with ultra-nationalist activism; he was simul­ta­ne­ously direc­tor of an OUN(b) front orga­ni­za­tion, the Cen­ter for the Study for the Lib­er­a­tion Move­ment. The revisionism cast the OUN/B as having fought the Nazis, a complete historical lie. The alleged anti-Nazi activity of the OUN/B co-exists in a remarkable political landscape with adulation of the 14th Waffen SS Division (Galicia) and its allied formations. Even as OUN/B is portrayed as having saved Jews from the Holocaust, its activities in murdering them is celebrated. Directly, explicitly and overtly evolved from the OUN/B, Swoboda retains all of the OUN/B’s fascism and bigotry, masked by nationalistic fervor. The fundamentals of Swoboda’s politics and character can be gleaned from examining party leader Oleh Tiahnybok’s ideological adviser. “Yurii Mykhal’chyshyn (b. 1982), Tiahnybok’s adviser on ide­o­log­i­cal mat­ters, Svoboda’s top name in the elec­tion to the Lviv city coun­cil and its can­di­date for mayor in 2010, rep­re­sents a more rad­i­cal cur­rent in the move­ment. Proudly con­fess­ing him­self part of the fas­cist tra­di­tion, Mykhal’chyshyn rel­ishes the harsh­ness, extrem­ism and uncom­pro­mis­ing rad­i­cal­ism of his idols of the 1930s and 1940s. In Canada, Tiahnybok was honored by veterans of the 14th Waffen SS Division. In the Ukraine, Swoboda held celebrations of the division, featuring and honoring veterans of the unit, returning the grace and favor deferred upon its leader. Tiahnybok ideological adviser Mykhal’chyshyn openly embraces street violence as a fundamental tactic. 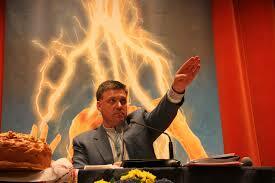 Tiahnybok ideological adviser Mykhal’chyshyn celebrates the Holocaust and supports Hamas. Swoboda is affiliated with other European fascist parties, including the Swedish fascist milieu to which Pirate Bay/WikiLeaks benefactor Carl Lundstrom belongs. EXCERPT: . . . . . Swept to power by the Orange Revolution, the third president of Ukraine,Viktor Yushchenko (2005–2010), put in substantial efforts into the production of historical myths. He tasked a set of nationalistically minded historians to produce and disseminate an edifying national history as well as a new set of national heroes. . . . . The other component was a heroic cult of the OUN(b), the UPA and their leaders. The “memory managers” juxtaposed the genocidal Soviet rule withthe self-sacriﬁcial heroism of the OUN-UPA, producing a teleological narrative of suffering (the famine) and resistance (the OUN-UPA) leading to redemption (independence, 1991). Curiously, Yushchenko’s legitimizing historians presented their instrumentalized use of history as “truth,” which they juxtaposed to “Soviet myths.” Wilfried Jilge, a historian at the University of Leipzig, writes that “[i]t takes place by means of discourse, rituals, and symbols and uses the past to provide legitimization and to mobilize the population for political purposes. . . . A reconstructed historical memory is created as ‘true memory’ and then contrasted with ‘false Soviet history’ ”(Jilge, 2007:104–105). Thus, Valentyn Nalyvaichenko, SBU director under Yushchenko, described the task of his agency as being to disseminate “the historical truth of the past of the Ukrainian people,” to “liberate Ukrainian history from lies and falsiﬁcations and to work with truthful documents only” (Jilge, 2008:179). Ignoring the OUN’s antisemitism, denying its participation in anti- Jewish violence, and overlooking its fascist ideology, Nalyvaichenko and his agency presented the OUN as democrats, pluralists, even righteous rescuers of Jews during the Holocaust.
. . . . . Ironically, the presentation of the OUN as resistance fighters against Nazi Germany coexists with an elaborate cult of the Waffen SS Galizien (Rudling, 2012a). Lviv streets have been renamed after Nazi collaboratorslike Roman Shukhevych and Volodymyr Kubijovyc. In the Lviv city hall, Svoboda is currently working to have the Lviv airport renamed after Bandera. Svoboda deputy Iuryi Mykahl’chyshyn stated, “We should have the airport named after Stepan Bandera. I don’t want to point any fingers. . . . But we will have a Bandera airport, a Bandera stadium, and the entire city will be carrying Bandera’s name, because he is its most living symbol”(“U L’vovi budut’ stadion,” 2012). In the fall of 2011, Svoboda deputies in a municipality in the Lviv district renamed a street from the Soviet-era name Peace Street (Vulytsia Myru ) to instead carry the name of the Nachtigall Battalion, a Ukrainian nationalist formation involved in the mass murder of Jews in 1941, arguing that “ ‘Peace’ is a holdover from Soviet stereotypes”(“Vulytsiu myru,” 2011). . . . Following violent clashes, the police detained more than 50 Svoboda activists, armed with gas canisters, smoke bombs and catapults. The Cherkasy branch of Svoboda criticized the police for their alleged failure “to stop and avert aggression by Hasidic Jews to Ukrainians” (“Uman: Righ-twing activists detained,” 2011).Svoboda’s anti-Russian and anti-Jewish rhetoric is accompanied by an anti-Polish message. Svoboda maintains that Poland has played a negative historical role in Ukrainian lands. The party demands an ofﬁcial apology from Poland for ﬁve hundred years of Polonization, from the 15th to the 20th centuries, and indemnities for “the Polish terror and occupation of Ukrainian lands in the 20th century” (“Zaiava VO ‘Svoboda’ shchodoproiaviv ukrainofobii,” 2010). Focusing on divisive and sensitive issues, Svoboda provocatively denies any involvement of the Waffen SS Galizien in atrocities against the Polish minority in Galicia. For instance, on the site of Huta Pieniacka, Svoboda hasplaced a huge billboard denying the conclusion of both Polish and Ukrainian historical commissions that the fourth police regiment, which was later adjoined to the Waffen SS Galizien, burnt this Polish village and slaughtered most of its residents on February 28, 1944. . . .
. . . . On April 28, 2011, Svoboda celebrated the 68th anniversary of the establishment of the Waffen SS Galizien. Octogenarian Waffen SS veterans were treated as heroes in a mass rally, organized by Svoboda and the “autonomous nationalists.” Nearly 700 participants (the or-ganizers claimed 2,000) marched down the streets of Lviv, from the massive socialist–realist style Bandera monument, to Prospekt Svobody, the main street, shouting slogans like “One race, one nation, one fatherland!,” . . . . Sorry to have been absent for so long. On the subject of Ukraine, there is a small detail that intrigues me with Chumachenko. She has the exact same coiffure or hairdo than Star Wars’ Princess Leia. It strikes me as no coincidence. Remember that in that movie, the “freedom fighters” fight against an “empire” under the tyrannic rule of a dark figure…It strikes me as if the West wants to put her in a good light against the “evil” Putin. I also have the impression that the West wanted to do what they are doing in Maidan for a long time, that movie being a propaganda piece to prepare the collective consciouness. I think it is Yulia Timoshenko, not Ykaterina [Chumachenko] Yuschenko, to whom you are referring. With all due respect, I don’t think it’s relevant. I’m no expert on Ukrainian native dress and coiffure, but I suspect it has more to do with local styling considerations. Opposition leader has emerged from prison to find a country much changed in her absence, and her political future far from certain. A cheering crowd, a returning martyr, an ethereal blond woman in a wheelchair, her head wrapped in iconic braids. It’s a clip straight out of Central Casting. But some say the abrupt appearance of once-imprisoned Ukrainian political leader Yulia Tymoshenko in Kyiv’s Maidan square may not be the trailer to a happy ending. Since Ukraine’s protests broke out three months ago, the opposition has been largely leaderless. But whether Tymoshenko is a comeback kid, or yesterday’s woman, is up for grabs as the country struggles to find its balance after the ouster of President Viktor Yanukovych. Tymoshenko, 53, was serving a seven-year prison sentence for abuse of office when parliament changed the criminal code to free her last week. The charges sprang from her negotiations with Russia over a gas deal, and many felt they were politically driven by her rival Yanukovych. As his popularity plummeted, sympathy for Tymoshenko rose and reports of brutal treatment and neglect of her health problems in jail sparked an international outcry. But in the 30 months Tymoshenko has been out of public view, things have moved swiftly in Ukraine, especially for a woman whose much-rumoured past casts murky shadows of the country’s old regime. Tymoshenko’s famous image — peasant braids and designer clothes — was carefully constructed to appeal to Ukrainian nationalism, while hinting at western efficiency. “Her hair is the symbol of Ukraine’s braided wheat sheaves,” said Wynnyckyj. Like much of Tymoshenko’s life, the image is a work in progress. Born in the largely Russian-speaking research town of Dnipropetrovsk in eastern Ukraine, she was the child of an impoverished single mother — and determined never to be poor again. She studied economics, went on to university and married at 18, giving birth to daughter Eugenia a year later. Her marriage to Oleksandr Tymoshenko, a scion of the Soviet elite, started her climb up the economic ladder, and his family joined her in an oil venture, the Ukrainian Petrol Corp.: “the first company of many that would demonstrate the murky and often Byzantine nature of (her) business dealings,” alleged MP Inna Bohoslovska in an ongoing biography on her website. After Ukraine’s 1991 independence, when fortunes were made overnight, Tymoshenko hit the jackpot. A newly minted millionaire, she transformed the petrol company into United Energy Systems of Ukraine, importing much of the country’s natural gas, and winning herself the label of Gas Princess. But her status as a Ukrainian oligarch was downgraded when she entered politics in 1996 as an MP, battling President Leonid Kuchma, a former communist official who retaliated by destroying her company. She would later lead her own political bloc, shape-shifting to her current blond braided image and perfecting her Ukrainian. After tumultuous years of combat with Kuchma, Tymoshenko became the most famous face of the Orange Revolution against his successor, Yanukovych, who was accused of rigging the 2004 election. But destructive infighting with fellow revolution leader Viktor Yushchenko, and a serious economic slump, deflated her popularity, and Yanukovych beat her in a 2010 presidential race. In her absence, three parliamentary leaders were in the forefront, but likely presidential front-runners have yet to appear. “There is a place for Tymoshenko in a different kind of role, but not political leadership,” says Wynnyckyj. “She doesn’t really understand civil society. What Ukrainians want now is a housecleaning of the whole political establishment. Notice that she lost in 2010 and her speech on the Maidan is characterized as a “flop” but she’s still not really facing any clear front-runner challengers for the presidency. So Tymoshenko is basically the front-runner if she decides to run but she’s also tainted by her own deeply corrupt past in a country deeply tired of corruption. This is going to be something to watch over the coming months because if Tymoshenko’s popularity plummets for whatever reason or if she decides not to run at all there’s going to be popularity vacuum and we’re all going to have to hope that the popularity vacuum doesn’t get filled with an even worse morality vacuum.